Sea Shepherd is planning a global protest to mark Chinchilla’s visit, including a large demonstration in Berlin on Wednesday. Watson is expected to attend. “We are calling for a Global Day of Action on Wednesday, May 23rd. On this day the President of Costa Rica, Laura Chinchilla, will be visiting German Chancellor Merkel in Berlin. Wednesday, May 23rd is S.O.S. Day – Save Our Skipper,” the group posted on its website. Sea Shepherd urged followers around the world to protest at German embassies and consulates Wednesday morning. The conservation group also claimed that the Taiwanese mafia – which controls a large part of the global shark-fin trade – had taken out a $20,000 contract on Watson’s life for the his work combating marine poachers. Over the weekend, the Costa Rican presidency and foreign ministries issued a joint statement seeking to justify the Costa Rican arrest warrant, issued last October, and steps the country has taken to promote local conservation. “Costa Rica’s [conservation] efforts include implementing a formula for development that is in harmony with nature, recognizing that it is written in our Constitution that every citizen has the right to a healthy and ecologically balanced environment. Costa Rica’s efforts have made it possible for the country to be one of the five most environmentally protected countries in the world,” the official statement said. 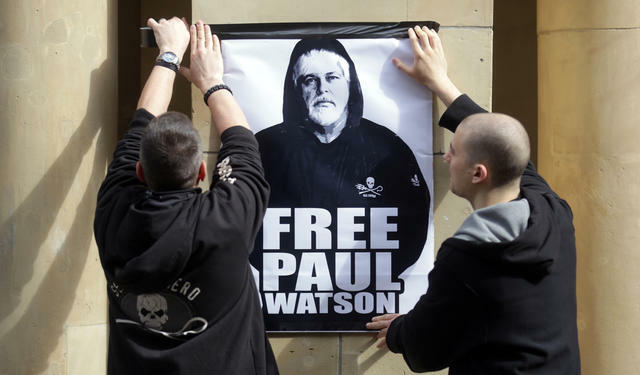 “On the contrary, what has been demonstrated by a video created by [Watson’s] assistants is that [Watson’s] boat rammed the Costa Rican fishing boat,” the statement said.